The Big Day: Budget 2014 – The Budgetpocalypse! I’ve said time and time again that I’m a logical guy. I guess it’s the accountant in me…but now that I’m a Father and husband (yet still an accountant at heart), my logic extends to the society and people around me, trying to right the wrongs of the world and making my daughter’s future (hopefully here in Montreal) more rosy. Bravo Quebec Government! Falling $600 million dollars short on revenues is….dare I say it….really difficult to comment on. I love using metaphors and in the case of the budget shortfall, I’m going to have a bit of fun. Remember, I’m an accountant and father to a 2-year-old girl so my idea of fun is playing with Dora the Explorer dolls and Thomas the Tank Engine (and friends). Which brings us to our metaphor. 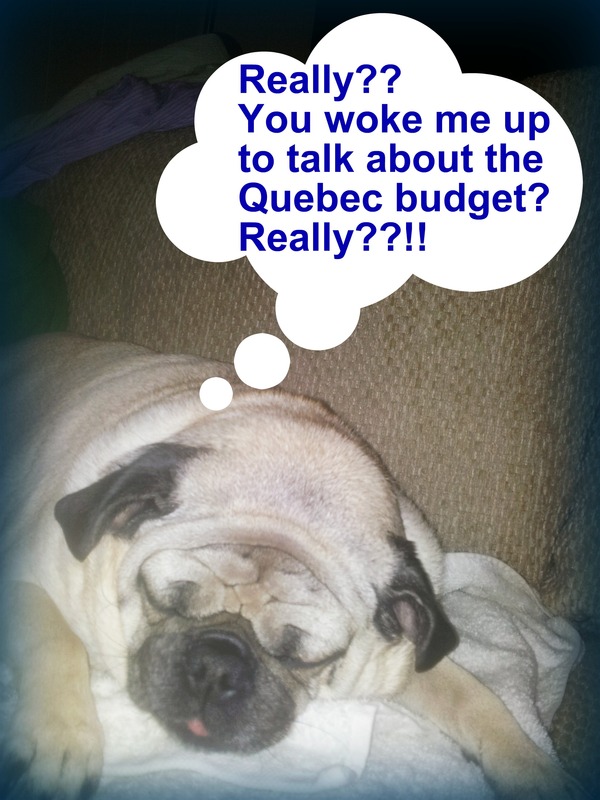 My little one’s birthday was back in December…the Quebec budget shortfall of $600 million on an original deficit estimate of $2.5 billion is a miss of about 25%. It would be the “birthday equivalent” of mistakenly celebrating my daughter’s birthday not in December but in the month of March. I’m sure she’d be real happy with Daddy being 3 months late to the party. Oh wait! I’ve got an even better one! Let’s say we made the decision to buy a shiny, new SUV and had set aside $30,000 for the car. We then arrived at the dealership and the salesman delivered the unfortunate news that the car would actually cost us $37,500. Not only that but we didn’t have the choice to refuse the higher price! We had already committed to buying the car and the additional $7,500 would be forcibly withdrawn from our bank account. I think you get the gist of it. I’m sure that questions will be asked and answered in the coming days and weeks about this miscalculation (for lack of a better term). From the perspective of an accountant with a Quebec-based clientele, I have a unique perspective in that I deal with Revenu Quebec (“RQ”) on a daily basis on behalf of clients. In recent months, I’ve seen a pattern emerge in my dealings with RQ, a pattern that is a bit disturbing but not entirely unexpected. Recently, there has been a marked increase in assessments sent out by RQ, activities designed to bring in revenues at an increased rate. Completely understandable in the current economic environment and entirely justified as they are simply following tax regulations. The troubling part relates primarily to the hiring practices employed by RQ to handle this increased workload. Put simply, on a phone conversation with an RQ agent the other day, the supposed “senior-level” agent on the call was very clearly lacking in knowledge in more than one area of the tax code. I’m not talking about some obscure regulation relating to farming expenses, I’m talking about the basics of the Provincial GST/QST system that should be second nature to anyone employed by RQ. Heck, the word REVENUE is in the name of the Department!! It seems to me that in their frantic search for more revenue after realizing how large a budget shortfall was on the horizon, RQ in effect went on a hiring binge of what amounts to a crew of collectors, who’s sole purpose is to make a money grab at the Quebec taxpayer. This is, of course, my opinion…but the troubling items mentioned above have been confirmed by fellow accountants who have had eerily similar experiences. It boggles my mind that this level of incompetence exists in our Provincial government, an institution we rely upon to manage the tax dollars we contribute in good faith. It only adds to what appears to be a very impressive portfolio of incompetence our current Government is slowly building. Come the next election, let’s all do our best to right the wrongs of the past 16 months. Don’t forget to follow me on Twitter if you like what you read! And as always, if you have tax questions, need advice on your personal taxes, corporate taxes or anything else accounting or business related, please contact The Funny Accountant/President of MK & Associates by phone at (514) 833-1158 or by e-mail at mitch@mkassociates.ca. Also, for a witty and insightful read, check out the wifey’s blog. It’s funny and good. And, last but not least, Anthony Housefather, our sitting Mayor here in Cote Saint-Luc, Quebec is running for the Liberal Party of Canada’s nomination in the Federal riding of Mont-Royal. In my opinion, he is clearly the best man for the job and it is my hope that others might have an interest in helping Anthony to achieve his goal of winning the Party’s nomination and making his way into the House of Commons as a Member of Parliament. If you live in the Mont Royal district and are interested in supporting Mayor Housefather’s campaign, please follow this link and sign up as a member of the Liberal Party (a $10 cost for the year). When the time comes, sometime later this year, you can then help nominate Anthony Housefather as Liberal candidate in our riding! Good luck Anthony!